Createspace Independent Publishing Platform, 9781544237947, 164pp. 331 INNINGS is a powerful tale narrated by elderly Nebraska native Jack Schram, a lifelong witness to the folly of war and hypocrisy. Jack tells of the bullying encountered by his nephew's son John, born with physical limitations and learning disabilities. It hasn't been easy either for John's close friend Sarah Jenkinson, harassed constantly since moving to the area a few years ago. While John relates that he wants to bring change to the world, all Jack can see is change of the unfortunate kind. Will John continue to cast his lot with two older ne'er-do-wells and follow through on the random acts of violence they fantasize about? Or find a better path? In a time when people ask what is going wrong with our children and ourselves and tragedies abound all over the globe, this is truly an inspirational story. 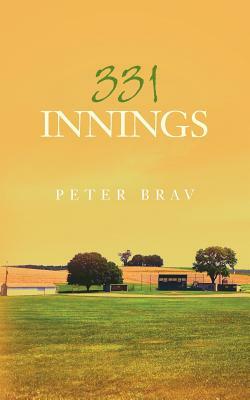 PETER BRAV is the author of the novels SNEAKING IN, THE OTHER SIDE OF LOSING and ZAPPY I'M NOT. He and his wife live in Princeton, New Jersey with three small dogs who make their presence felt always.